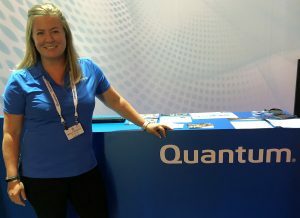 Fresh off naming Jamie Lerner president/CEO in June, Quantum arrived in Amsterdam for IBC 2018 with enhancements to the Xcellis scale-out storage-appliance portfolio, including the latest version of StorNext (v6.2) with plenty of new features and the addition of Excelero private-labelled NVMe (non-volatile memory express) storage to accelerate ingest and other high-performance media tasks. NVMe offers 22-Gbps streaming bandwidth and can boost ingest speed by up to 10 times. In addition, Xcellis can now deliver shared content and files across SAN and NAS, creating the optimal solution for hybrid Fibre Channel/Ethernet environments. Quantum also now offers an Amazon S3 interface to Xcellis appliances, facilitating integration into cloud- or web-based applications. SVG sat down with Molly Presley, VP, product management and global marketing, Quantum, to discuss the new features available in StorNext 6.2, the potential power of NVMe for live broadcasting, how the company can serve organizations using hybrid on-premises/cloud infrastructure, and what customers can expect from the company under its new CEO. What are the key new features in StorNext version 6.2? We are putting a big focus on NVMe this year and have introduced a new NVMe tier, which is essentially the next generation of SSD. StorNext is known for being the most high-performance file system for media workflows like 8K, 16K, and beyond, and this will provide a significant increase in performance. This is enabling leading-edge, high-end users that are really reliant on performance. And then it will eventually come down to the mainstream market as it becomes more affordable. Which new feature is most relevant to the sports-video-production sector? We have several new [features], but probably the biggest thing for the sports market is the SAN and NAS Access [capability]. Most of our StorNext customers were on Fibre Channel SAN networks but are wanting to move to IP-based workflows. And so they would go out and start a new RFP or a new project to [establish] the necessary infrastructure to be able to accomplish that, which caused a lot of headaches: forklift [upgrade], two systems in parallel, two sets of data, and all of that. This enables those Fibre Channel environments to not only use the same system to connect your IP and your Fibre Channel, but you can also share the data. So you have this huge content repository, and you don’t have to store two copies of everything as you start to move over to IP. We’re the only vendor in the industry who is doing this right now, and it’s helping our customers to slowly feather in their IP workloads, while also sharing their data. If they end up [migrating to IP] this year, three years, five years from now, it really doesn’t matter. Anything else new in StorNext? The other thing that we’ve really been emphasizing is the increased ease of use of StorNext. StorNext is the ultra-high-performance beast and, as a result, is known for being somewhat tough to manage. And so we’re trying to take that on and not just rest on our laurels. We don’t want our customers to think they can’t replace this because nothing else is as powerful, but, instead, we want to make the system easier to use. So that’s the other big trend you’ll see with a lot of our releases coming up. Web-based monitoring is also an important new [tool]. Now a customer can go into a cloud-based tool, see all their infrastructure, the health of their infrastructure, if any of their file systems are getting full, if they’re running out of capacity, any of those things. And then we’ve created a super-intuitive real-time web-based GUI. When we showed this to our customers at a recent user group meeting — and you don’t hear this much — we actually heard oohs and ahhs. We’ve also added an S3 interface to StorNext. A lot of the asset managers are now writing to S3, and we are just making sure that StorNext is accessible in whichever whatever way the applications are writing data. StorNext is becoming this huge content repository, and you have a lot of users that have different requirements, so we have added new administrative capabilities to manage quality-of-service for specific users and applications. And then the other piece is for billing purposes. If you wanted to be able to set quotas on the storage — that you’re only allowed a petabyte or 10 petabytes — you can now set administrative policies on the system. More and more sports-media organizations are deploying as multisite and remote/at-home workflows. How is Quantum catering to those needs? We are also working very hard on improving collaborative workflows, where you have multisite or multiple users in different locations and we can move the data around effectively. We have built replication into StorNext, which is designed so that you can ingest the content at one facility and you can push just a portion of the content to editors at other sites so they can make changes and then synchronize it back to the main system for archive [purposes]. So [this serves] data-content protection and content-repository protection, as well as for the active work. We used to be able to do that only for the active work; we didn’t have replication for the archive. Several companies in the M&E sector — including Quantum — are incorporating NVMe storage into their solutions. Why do you think this technology makes a difference for broadcasters? For live broadcast, I think NVMe is an area that is going to get a lot more attention in the coming years. In live broadcast, you need to have an extremely high-performance ingest, and then you need to have the ability to edit, archive, and so on. I think you’re going to start to see NVMe in use a lot of cases for live broadcast because you have to be so dynamic with your work in that market. Content comes in, and [broadcasters] have to be able to edit and share that content extremely quickly. And, in the background, the StorNext system can move it off for the rest of the work that you’re going to be doing. I think we’ll see more adoption of it in that area for [quick-turnaround] applications. Many broadcasters are adopting hybrid on-premises/cloud storage infrastructures. How is Quantum impacted by this, and how are you looking to serve customers that are heading in this direction? The [hybrid model] is how a huge portion of our users are using StorNext solutions. For example, I recently heard Deluxe [Entertainment Services Group] CIO Cindy McKenzie talking about how they rely on StorNext for exactly that. They have an all-cloud initiative, but it’s realistically going to take years and years to get there, so she chose StorNext specifically for that reason. She knew she could get the work done on premises and the performance attributes and everything she wanted with StorNext. And then, as she moves to the cloud, StorNext can manage data in the cloud just like it can on premises, so it met her high-performance demand today and provided a path for the future. It can archive to wherever she wants, so, at some point, if she wants to move her high-performance work, she doesn’t have to move her data as well. The metadata is the same whether your content is stored in Amazon S3, a private object-store cloud, tape, or SSD. That’s why the hybrid cloud solutions work so great with StorNext: [the user] can move their storage around and move their compute power around, but the metadata is all the same. With new President/CEO Jamie Lerner now in place, what can the market expect from Quantum, and what is your message to customers regarding the state of the company? We are doubling down on what Quantum does best, which is video-data storage. There is really no company focused on being the specialist in video data like Quantum, so it makes sense for us to focus on that. From an M&E perspective, we feel we have a lot offer and a strong future ahead. In addition, more than half the world’s data today is [composed of] images and video so there will be a massive growth in unstructured data [for that] rich media. Yes, there will be photos, videos, audio files, but there will also be video surveillance from autonomous vehicles, cameras sitting on street lights, all these different things. We’re really going to focus on positioning Quantum as the best technology and the leader for image and video-data storage. We’re doubling down on our history in M&E and believe there is a great future [in that market], but we also see a future in markets that have large video-data needs outside of M&E.